Apache Syncope is an Open Source system for managing digital identities in enterprise environments, implemented in Java EE technology and released under Apache 2.0 license. Who has access to What, When, How, and Why? What is Identity Management, anyway? Computers work with records of data about people. Such records contain technical information needed by the system for which the account is created and managed. A representation of a set of claims made by one digital subject about itself. It’s you! Have you ever been hired by a company, entered an organization or just created a new Google account? Companies, organizations and cloud entities work with applications that need your data to function properly: username, password, e-mail, first name, surname, and more. Where is this information going to come from? And what happens when you need to be enabled for more applications? And what if you get promoted and acquire more rights on the applications you already had access to? Most importantly, what happens when you quit or they gently let you go? 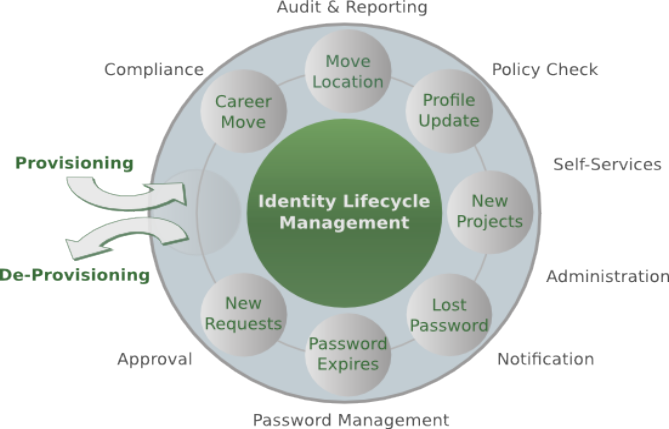 In brief, Identity Management takes care of managing identity data throughout what is called the Identity Lifecycle. Copyright © 2019, the Apache Software Foundation. Apache, Syncope, Apache Syncope, the Apache feather logo and the Apache Syncope project logo are trademarks of The Apache Software Foundation. All other marks mentioned may be trademarks or registered trademarks of their respective owners.